In two categories, The Brew’s stories were considered the best among all entries. Above: The awards were handed out after the association’s annual luncheon. 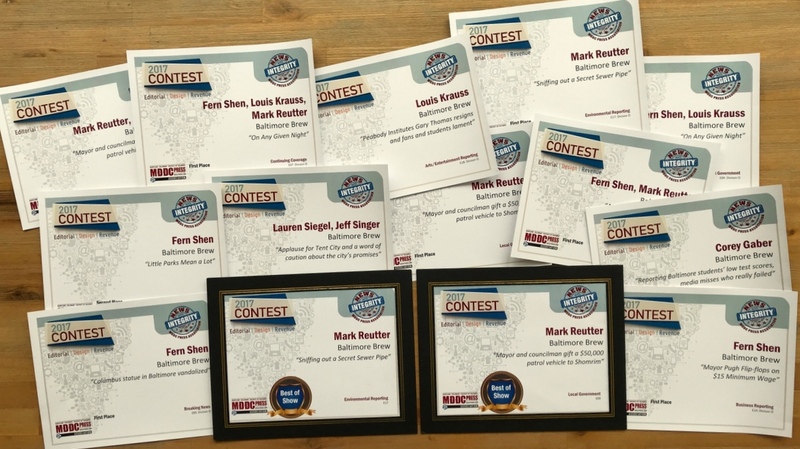 Baltimore Brew was awarded 14 Maryland, Delaware, District of Columbia (MDDC) Press Association prizes during the group’s annual meeting in Annapolis on Friday. Competing in the online publications division, The Brew won first or second place in 10 categories, including public service, critical thinking, breaking news, continuing coverage, land-use reporting, arts and entertainment, business reporting and local government. In two categories – local government and environmental reporting – The Brew’s submission was considered “Best in Show” among all divisional award winners. Among those competing for the Best in Show prizes were The Baltimore Sun, Frederick News-Post, Star Democrat, Daily Times and other newspapers. Founded in 2009 by former Washington Post reporter Fern Shen, The Brew concentrates on Baltimore area news. It expanded into accountability and investigative reporting when Mark Reutter, a book author and former Sun reporter, joined in 2011. The two-person publication, which employs occasional interns, is now viewed by over 70,000 unique visitors a month. The awards covered calendar year 2017. The Brew won four MDDC awards in 2016, including a “Best in Show” for its coverage of Kevin Plank’s proposed Port Covington development. More than 2,300 entries were submitted in the competition from news media across Maryland, Delaware and D.C., according to MDDC executive director Rebecca Snyder. The Brew submitted entries only in editorial news categories; awards were also announced on Friday in sports, design, photography, advertising, video and other areas.